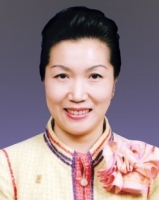 Ms Cheung is Chairman of Forest Zone Limited, a company with businesses ranging from real estate investment, stock trading, trading to entertainment production. She is a member of the Standing Committee of the Chinese People’s Political Consultative Conference in Nanjing. Actively engaging herself in community service and philanthropic activities, particularly in education in Hong Kong and Nanjing, Ms Cheung was awarded a Medal of Honour by the HKSAR Government in 2007 in recognition of her significant contributions to the community.